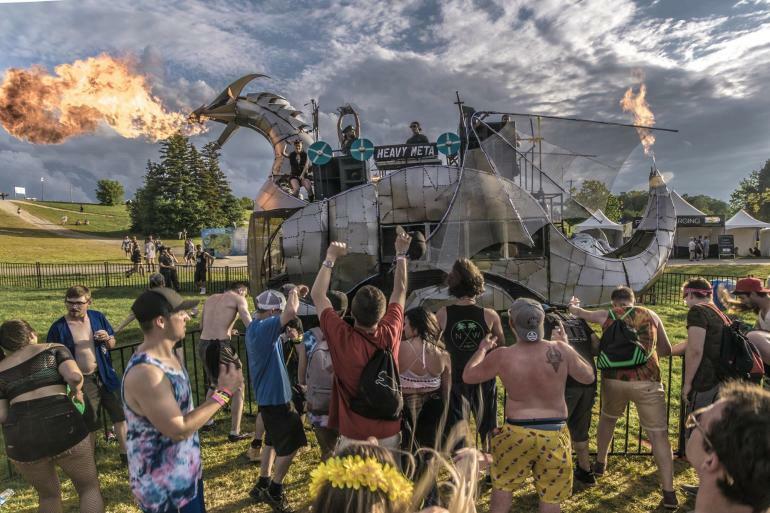 A​ ​flaming​ ​dragon​ ​art​ ​car?​ ​Yes!​ ​Heavy​ ​Meta,​ ​Canada’s​ ​largest​ ​art​ ​car,​ ​will​ ​be​ ​making​ ​its​ ​first Rochester​ ​appearance​ ​at​ ​Rochester​ ​Mini​ ​Maker​ ​Faire!​ ​Heavy​ ​Meta​ ​is​ ​a​ ​massive​ ​(30​ ​foot-long,​ ​19​ ​foot-high,​ ​8 foot-wide)​ ​metal​ ​dragon.​ ​Made​ ​of​ ​hand-cut,​ ​hand-welded​ ​sheet​ ​metal​ ​panels,​ ​Heavy​ ​Meta​ ​is​ ​a​ ​terrifying​ ​and beautiful​ ​beast,​ ​a​ ​10,000​ ​watt​ ​sound​ ​system,​ ​and​ ​pneumatic​ ​effects​ ​that​ ​open​ ​&​ ​close​ ​the​ ​jaw,​ ​and​ ​15​ ​foot wings.​ ​And​ ​it​ ​shoots​ ​huge​ ​fireballs​ ​from​ ​its​ ​tail​ ​and​ ​animatronic​ ​mouth. In​ ​addition,​ ​a​ ​couch​ ​that​ ​you​ ​can​ ​ride​ ​as​ ​it​ ​drives​ ​around​ ​the​ ​faire,​ ​an​ ​antique​ ​Hercules​ ​“hit​ ​and​ ​miss”​ ​engine that​ ​makes​ ​fresh,​ ​home​ ​churned​ ​ice​ ​cream,​ ​a​ ​violin​ ​that​ ​lights​ ​us​ ​as​ ​you​ ​play​ ​it,​ ​a​ ​robot​ ​petting​ ​zoo,​ ​Toothpick spaceships​ ​from​ ​Star​ ​Wars,​ ​Star​ ​Trek,​ ​and​ ​Battlestar​ ​Galactica,​ ​a​ ​sand​ ​mandala​ ​demonstration,​ ​and​ ​loads​ ​of textiles​ ​--​ ​these​ ​and​ ​more​ ​than​ ​100​ ​Makers​ ​will​ ​be​ ​coming​ ​together​ ​at​ ​Rochester​ ​Riverside​ ​Convention​ ​Center on​ ​November​ ​18th​ ​for​ ​the​ ​4th​ ​Annual​ ​Rochester​ ​Mini​ ​Maker​ ​Faire. First​ ​time​ ​visitors​ ​to​ ​the​ ​faire​ ​will​ ​be​ ​inspired​ ​by​ ​the​ ​creativity​ ​and​ ​ingenuity​ ​of​ ​the​ ​Maker​ ​Movement​ ​--​ ​a celebration​ ​that​ ​is​ ​part​ ​show​ ​and​ ​tell,​ ​science​ ​fair,​ ​craft​ ​fair,​ ​and​ ​carnival.​ ​Those​ ​who​ ​have​ ​already​ ​been​ ​to Maker​ ​Faire​ ​will​ ​be​ ​delighted​ ​to​ ​see​ ​both​ ​familiar​ ​and​ ​new​ ​Makers​ ​--​ ​35%​ ​of​ ​the​ ​exhibits​ ​this​ ​year​ ​are newcomers​ ​to​ ​the​ ​Maker​ ​Faire. 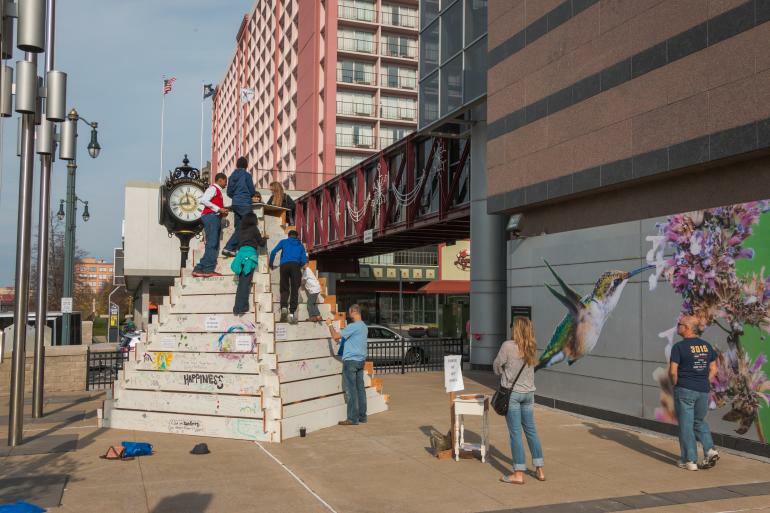 This​ ​celebration​ ​of​ ​the​ ​DIY​ ​spirit​ ​and​ ​creativity​ ​in​ ​the​ ​heart​ ​of​ ​Downtown​ ​Rochester​ ​is​ ​a​ ​full-on​ ​community festival​ ​with​ ​attractions,​ ​exhibits,​ ​demonstrations,​ ​and​ ​performances​ ​showcasing​ ​the​ ​intersection​ ​of​ ​science, technology,​ ​arts,​ ​and​ ​crafts​ ​--​ ​many​ ​of​ ​them​ ​immersive​ ​and​ ​interactive. 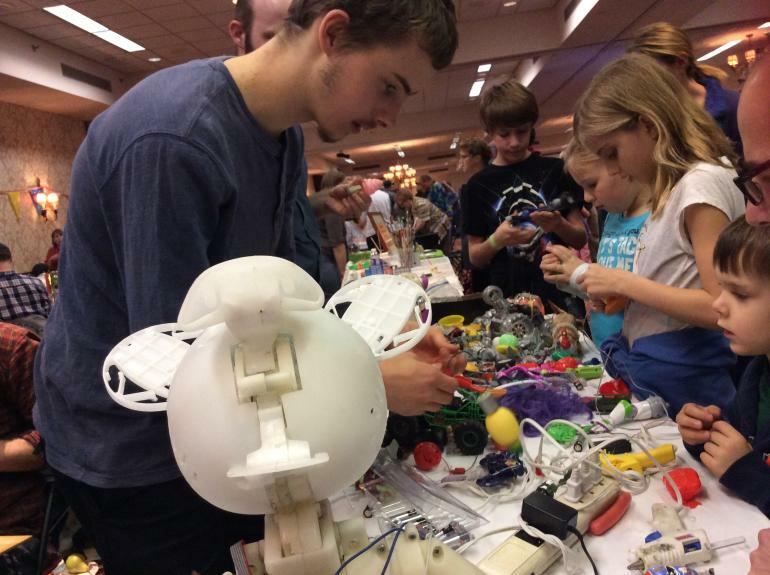 The​ ​Rochester​ ​Mini​ ​Maker​ ​Faire​ ​celebrated​ ​its​ ​first​ ​event​ ​in​ ​November​ ​2014​ ​with​ ​over​ ​90 maker​ ​exhibits​ ​from​ ​across​ ​Western​ ​New​ ​York​ ​and​ ​1,500​ ​visitors​ ​of​ ​all​ ​ages​ ​in​ ​attendance. Over​ ​the​ ​last​ ​three​ ​years,​ ​the​ ​faire​ ​has​ ​grown​ ​to​ ​over​ ​130​ ​makers​ ​and​ ​3,000​ ​attendees.​ ​Maker​ ​Faires​ ​can​ ​be found​ ​all​ ​over​ ​the​ ​world.​ ​In​ ​2017,​ ​over​ ​200​ ​Maker​ ​Faires​ ​were​ ​held​ ​around​ ​the​ ​globe. 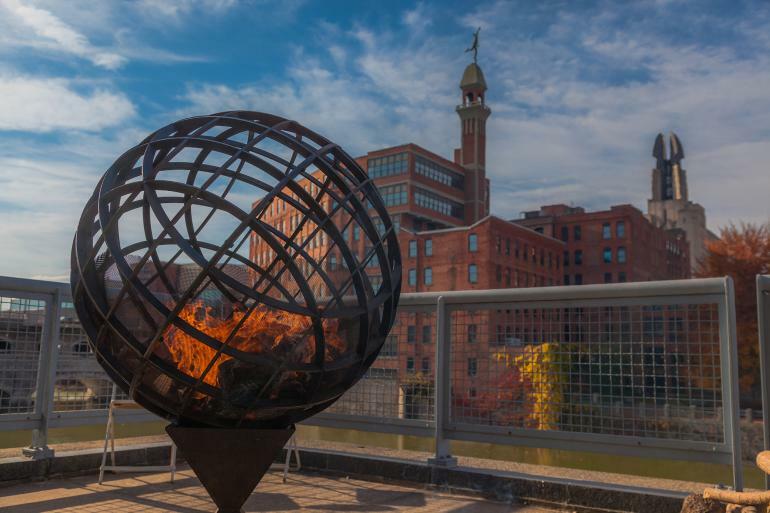 ● See​ ​Heavy​ ​Meta,​ ​the​ ​flaming​ ​dragon ● Warm​ ​up​ ​beside​ ​a​ ​spherical​ ​sculpture​ ​with​ ​a​ ​wood​ ​burning​ ​fire,​ ​created​ ​by​ ​Groovy​ ​Geometry ● See​ ​students​ ​take​ ​a​ ​ride​ ​on​ ​a​ ​robotic,​ ​driveable​ ​couch ● Visit​ ​our​ ​“Dark​ ​Room”​ ​to​ ​see​ ​LED​ ​art​ ​including​ ​light-up​ ​violins ● Learn​ ​to​ ​solder​ ​your​ ​first​ ​electronics​ ​project ● Enjoy​ ​an​ ​old-fashioned​ ​ice​ ​cream​ ​from​ ​a​ ​gear-driven​ ​“hit​ ​and​ ​miss”​ ​ice​ ​cream​ ​machine ● Participate​ ​in​ ​hands​ ​on​ ​activities​ ​for​ ​all​ ​ages ● Explore​ ​the​ ​world​ ​of​ ​textiles ● Listen​ ​and​ ​record​ ​your​ ​own​ ​maker​ ​adventures​ ​with​ ​Storychick​ ​Storybooth ● Learn​ ​to​ ​use​ ​one​ ​of​ ​a​ ​dozen​ ​sewing​ ​machines​ ​in​ ​attendance ● See​ ​a​ ​pancake​ ​bot​ ​make​ ​works​ ​of​ ​art​ ​from​ ​pancakes ● Sample​ ​fresh-pressed​ ​cider ● Be​ ​inspired​ ​by​ ​kid​ ​Makers,​ ​including​ ​the​ ​Rosie’s​ ​Robots,​ ​a​ ​11​ ​year​ ​old​ ​roboticist ● Play​ ​over​ ​a​ ​dozen​ ​video​ ​and​ ​board​ ​games​ ​developed​ ​right​ ​here​ ​in​ ​Rochester ● Meet​ ​cosplayers​ ​and​ ​prop​ ​replicators​ ​with​ ​Flower​ ​City​ ​Comic​ ​Con ● Learn​ ​to​ ​use​ ​a​ ​table​ ​loom​ ​and​ ​weave​ ​a​ ​project ● Marvel​ ​at​ ​a​ ​theme​ ​park​ ​built​ ​with​ ​K&apos;nex ● Take​ ​a​ ​look​ ​through​ ​the​ ​Smartphone​ ​Microscope ● Drive​ ​robots​ ​with​ ​local​ ​FIRST​ ​Robotics​ ​teams ● Make​ ​and​ ​learn​ ​with​ ​makerspaces​ ​from​ ​around​ ​Rochester ● Launch​ ​rockets​ ​through​ ​recreational​ ​plumbing ● Discover​ ​a​ ​monthly​ ​electronic​ ​kit​ ​developed​ ​in​ ​Buffalo ● Take​ ​a​ ​spin​ ​with​ ​fidget​ ​spinners​ ​that​ ​light​ ​up ● Meet​ ​a​ ​mermaid ● Try​ ​on​ ​a​ ​Big​ ​Face​ ​Box​ ​and​ ​watch​ ​your​ ​face​ ​become​ ​huge.